About as long as it is tall, a typical Jack Russell is small, sturdy and strong. Their heads are typically flat with some width at the ears, a medium-length muzzle, black nose, alert almond-shaped eyes, a strong jaw and muscular cheeks. They have muscular necks that slope down to a fairly shallow chest, strong front legs and muscular hindquarters. The tail is normally in proportion to body length, set high but not curled up. Jack Russell Terrier coats are smooth but tough enough to be protective, and the colors are typically white with black, tan or brown. Dont be surprised by the small size: Jack Russell Terriers can be a handful. Amazingly athletic and bursting with energy, they have natural instinct to hunt, track and solve problems in the wild. If you live in a city or the suburbs, your Jack Russell will want plenty of walks and excursions. In an apartment or small home, you’ll almost hear the “humming” energy of your JRT: They are perky, lively and fiercely protective of their environments. And they make great guard dogs: A stranger approaching the house will be met with relentless barking. Not only are they useful, they can be—with the proper focus and training—excellent members of the family: loyal, loving and fun. Jack Russell Terriers have a fierce, headstrong independence and need special attention to maintain an even keel. For this reason, some experts recommend that only experienced dog handlers should have one. Animal shelters around the country have plenty of unmanageable Jack Russells whose owners raised them untrained and unchecked. Apartments are okay for Jack Russells, but a fenced-in yard is ideal—they love to bark and dig and chase small animals. However, a fenced-in yard will often not be enough for these dogs. Though small, they can leap very high and have been known to jump fences when they get bored and restless. On a walk, always keep them on a leash. They are incredibly fast, plus they have an intense curiosity and a fearlessness that could get them into trouble with bigger dogs. Jack Russell Terriers get along fine with the whole family, but young children should be taught not to tease or hurt them. A healthy Jack Russell can live as long as 15 years. Common health issues include cataracts and joint problems, but this is a solid breed with relatively few health issues. Jack Russell, an English clergyman, developed the Jack Russell Terrier in the mid-1800s to hunt foxes and other small game. At this time, the dogs were called “fox terriers,” prized for their endurance on long hunts and ability to dig animals out of their dens. 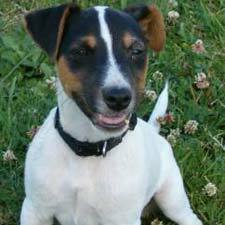 The term “Jack Russell Terrier” was coined after Rev. Russell’s death in order to distinguish the small working dogs from the existing “fox terriers,” which were larger. Even today, Jack Russell Terriers constitute a wide range of different types.